I was blown away by the beautiful animation of this movie. Hands down it is better than The Lion King or anything else I've seen, quite frankly. However, the story, characters, and music don't quite match up, thus I'm not going to say this is one of the best animated films of all time. With that said though, this is an enjoyable movie, though probably best suited for older children due to an overall somber and serious mood. 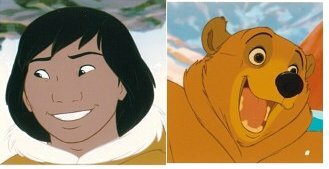 A young Eskimo boy named Kenai (voiced by Joaquin Phoenix) is desperate to become a man. His older brothers were able to achieve their manhood with vision and bravery, but Kenai's grandmother tells him that in order for him to become a man he must use love. This isn't too appealing to young Kenai, and he gets much ribbing from his brothers. 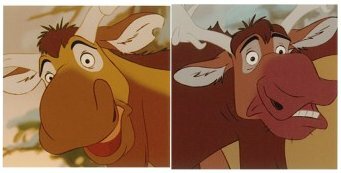 When Kenai rejects the idea of love and instead tries to take on a bear to prove his manhood, his older brother winds up dying in the process. Thirsty for revenge and a chance to make up for himself, Kenai vows to kill the bear that he now holds responsible for his brother's death. Once he does this, however, his brother's spirit turns HIM into a bear to teach him a valuable lesson. Kenai soon meets up with a young orphaned Cub, named Koda, whom he wants nothing to do with. Eventually, Kenai learns to love Koda as they journey towards "where the lights touch the mountain" which signifies Kenai's only hope of changing back into a man. The story is touching, although somewhat confusing, even for adults. One reason for this is that the main character development involves a boy and a bear and it is a bit difficult to think of them as one. Another obstacle is that it is hard to identify with a boy who turns into a bear, even if only metaphorically...for when do we ever "change" into something else in order to learn a lesson? I can't think of anything. The story is also, as I mentioned earlier, quite somber. It involves not only one, but two deaths (Kenai's brother and Koda's mother). Luckily, to lighten the mood there are two Canadian Moose who are really very funny, eh? They are voiced by Rick Moranis and Dave Thomas. The music, by Phil Collins is very good, although there are really only one or two songs as opposed to the entire host of songs offered up by earlier, better Disney films such as The Little Mermaid, Beauty and the Beast, Aladdin, or The Lion King. Best for older kids and nature lovers. The animation is spectacular. 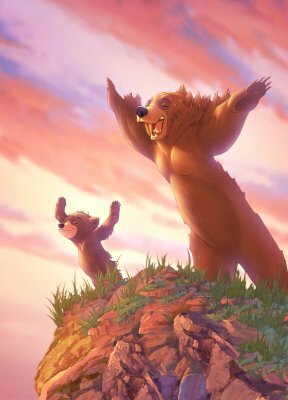 How would you rate the movie Brother Bear? There have been 15405 people to visit this page since Sat, Nov 1, 2003. And you are the first person to visit this page today!